The largest and most recent development of the Gulfstream line of corporate jets, the Gulfstream V-SP, based off the Gulfstream IV, boasts notable improvements from its predecessor. Including a new and advanced wing design, specifically optimized for speed, the G-VSP is fastest in its class and also has the longest cabin length in its class. The original inspiration for the Gulfstream GV-SP can be traced to the original late 1950’s Grumman Gulfstream I turboprop aircraft. However, with the upgrades implemented in this model, the original design is hard to detect, with the fuselage cross section being the only discernable feature retained from the original design. The straight wing design and turboprop engines utilized on the G1 were replaced with swept wings and turbofan engines, allowing the Gulfstream GV-SP to fill the market need for a intercontinental, large executive aircraft. The Gulfstream GV-SP is capable of comfortably accommodating nineteen passengers while still allowing for a crew of up to four. However, the cabin is usually arranged to accommodate eight to ten passengers while featuring amenities such as a full lavatory with shower, a crew rest area, a conference or dining room, and work stations. The cabin of the Gulfstream GV-SP measure 43.93 feet in length, reaches 6.2 feet in height, and stretches 5.5 feet in width with a maximum width of 7.3 feet. 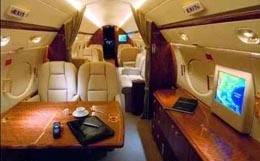 This private business jet offers 226 cubic feet of luggage capacity capable of accommodating 2,500 pounds of baggage. With a cabin pressure differential of 10.2 psi, the GV-SP is capable of maintaining a sea level cabin altitude while flying at an altitude of 29,200 feet. The Gulfstream GV-SP comes equipped with two Rolls-Royce BR-710A engines. Each engine is capable of producing 15,385 pounds of thrust at 15 degrees Celsius. With these powerful engines, the GV-SP needs 5,960 feet of runway to take off on a standard day. 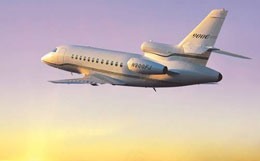 To land, this private business jet requires only 2,200 feet of runway with four passengers on board. The GV-SP features an intercontinental range of 6,750 nautical miles and has a maximum certificated service ceiling of 51,000 feet. 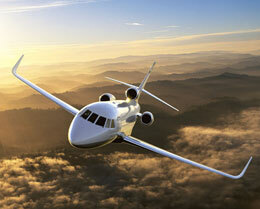 The Gulfstream GV-SP is capable of climbing to an altitude of 37,000 feet in just 18 minutes. For a flight to a more distant destination, the GV-SP is capable of maintaining an airspeed of 459 knots at an altitude of 45,000 feet in a long range cruise configuration. For a swifter flight, this private business jet is capable of maintaining an airspeed of 488 knots at an altitude of 43,000 feet in a high-speed cruise configuration. The avionics system selected for the GV-SP is the Honeywell SPZ-8500 system, which is a combination of select Primus 2000 equipment and the SPZ-8000 system. Six large-format cathode ray tube (CRT) displays have been incorporated into the design. Included in the avionics systems are triple Laseref III inertial reference systems, two flight management systems (FMSs) with provisions for an additional FMS, dual Mode S transponders, triple digital air data computers (ADCs), a Primus 880 weather radar, an automatic direction finder (ADF), dual Collins VHF comm and nav radios with distance measuring equipment (DME), high frequency (HF) transceivers, and radio altimeters. This system also offers the option to include a heads up display (HUD) system with Enhanced Vision System (EVS) system capability. 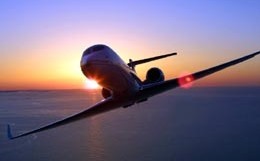 For more information about chartering, leasing or buying a Gulfstream GVSP please contact us by calling +44-20-3874-8091 or send us an email here.